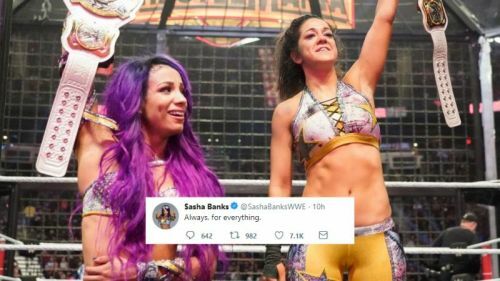 Sasha Banks appeared to thank Bayley, tweeting: "Always, for everything"
The Revival’s Scott Dawson recently explained in a ‘WWE Now’ interview that Sasha Banks & Bayley’s legacy in the wrestling business will forever be the WWE Women’s Tag Team titles. Why? Because while The Boss ‘n’ Hug Connection spent most of 2018 competing in relatively meaningless televised matches against The Riott Squad, they were trying to make a difference off-screen by persistently “annoying” Vince McMahon and attempting to persuade him to introduce a female tag division. In December 2018, they finally got their wish when Vince himself announced on the Christmas Eve episode of Raw that the titles will be launched in 2019. Two months later, Banks & Bayley outlasted five other teams at Elimination Chamber to become the inaugural holders of the new titles. From that moment on, it looked as though they were set to have a lengthy reign as Champions, or they would at least be allowed the television time to build an interesting storyline to make the titles really mean something. However, after just one successful defence against Nia Jax & Tamina, they were defeated by The IIconics in a Fatal 4-Way match at WrestleMania 35. There have been all sorts of stories since then about Banks’ future in WWE, with some reports stating that she has requested her release. From an on-screen perspective, this story became even more intriguing during the Superstar Shake-Up, when Bayley was surprisingly drafted to SmackDown Live as a singles competitor. So, just two months after the Women’s Tag Team titles were introduced, how have things gone so wrong so quickly? Let’s take a look at five theories why WWE decided to split up Banks, who is still on Raw, and new SmackDown recruit Bayley. It was recently reported by Pro Wrestling Sheet’s Ryan Satin that Sasha Banks and Bayley complained in the locker room and in front of one of their hotel rooms about losing the Women’s Tag Team titles at WrestleMania 35. If correct, this is obviously not a good look for the inaugural Tag Team champions. Bayley was heavily booed during her SmackDown Live debut on Tuesday, while Banks’ name also received jeers despite the fact that she was not even on the show. Moving forward, perhaps WWE decided that the duo had gone as far as they could as a babyface tag team, even at this early stage, and that it was time to split them up.